The muscular body of the GLC is wind-tunnel-honed and track-toned. A long wheelbase, big wheels and wide track add up to space, stability and sportiness. Crisp proportions and chrome details attract admiring eyes like it's drawn to the road. A muscular shape is just the start of a GLC, There's something for everyone in the GLC. from heated power front seats which include memory and lumbar adjusters to a 241 hp and a 9-speed transmission the turbo GLC 300 4MATIC can rush to 100 in 6.4 seconds. Its Direct Injection and multispark ignition can self-tune in milliseconds.4MATIC® continually sends the engine's torque to the wheels that can put it to the best use. On slippery roads, it elevates driving confidence. It's lightweight, nimble and fuel-efficient, to enhance handling and fun year-round. 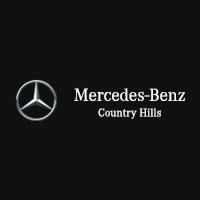 The state of the art facility at Mercedes-Benz Country Hills provides customers with an experience unlike any other. 3 lane service drive thru, 30 service lifts, Mercedes-Benz parts specialists and boutique, AMG Performance Center, the Benz Bistro, and Country Hills Kids Club are all here for your benefit. If you should have any questions regarding this vehicle or another in our inventory, please give us a call (403-930-7778) or pay us a visit at Mercedes-Benz Country Hills. Price includes $785 in dealer fees and levies. NO HIDDEN FEES. Plus GST. AMG: Driving performance for 50 years In an old mill in 1967, two automotive engineers with a passion for motorsports began turning Mercedes-Benz sedans into winning racecars. Today, as the performance division of Mercedes-Benz, AMG continues to create victory on the track and desire on the streets of the world. Every Mercedes-AMG vehicle is the product of craftsmen, designers and engineers who live to test limits, and for a singular goal: Driving Performance. The precision, craftsmanship and advanced performance technology is not only under the hood of an AMG GLE SUV. You can feel it from behind the wheel, too, from its exclusive controls to its exquisite cabin appointments. From the AMG-enhanced front air dam and 21-inch AMG wheels to their symphonic tailpipes, the AMG GLE SUVs capture admiring eyes. Biturbo engines, performance all-wheel drive and air suspension reveal thousands of details in impeccable harmony. Based on AIRMATIC®, the AMG Sport Suspension turns pressurized air into poised performance. It's also height-adjustable and adaptive. The many modes of AMG DYNAMIC SELECT let you dial in the shifting, throttle response, exhaust sound, and suspension settings. Reach out to one of our professional Brand Specialists today to arrange a viewing and test drive. The state of the art facility at Mercedes-Benz Country Hills provides customers with an experience unlike any other. 3 lane service drive thru, 30 service lifts, Mercedes-Benz parts specialists and boutique, AMG Performance Center, the Benz Bistro, and Country Hills Kids Club are all here for your benefit. If you should have any questions regarding this vehicle or another in our inventory, please give us a call (403-930-7778) or pay us a visit at Mercedes-Benz Country Hills. Price includes $785 in dealer fees and levies. NO HIDDEN FEES. Plus GST. This 4 door SUV comes in the Stunning Selenite Grey Met exterior with Black Leather interior. Our unit features the Premium package which includes Smartphone integration, Apple Carplay and Google Android Auto, Blind spot assist, THERMOTRONIC Automatic Climate control, LED High Performance lighting and the 8 inch Central Media Display. The intelligence package includes active distance assist DISTRONIC, active blind spot assist, active lane keeping assiatance, Pre-Safe Plus, active steering assist, and active brake assist with cross-traffic function. The state of the art facility at Mercedes-Benz Country Hills provides customers with an experience unlike any other. 3 lane service drive thru, 30 service lifts, Mercedes-Benz parts specialists and boutique, AMG Performance Center, the Benz Bistro, and Country Hills Kids Club are all here for your benefit. If you should have any questions regarding this vehicle or another in our inventory, please give us a call (403-778-0736) or pay us a visit at Mercedes-Benz Country Hills. Price includes $785 in dealer fees and levies. NO HIDDEN FEES. Plus GST.The state of the art facility at Mercedes-Benz Country Hills provides customers with an experience unlike any other. 3 lane service drive thru, 30 service lifts, Mercedes-Benz parts specialists and boutique, AMG Performance Center, the Benz Bistro, and Country Hills Kids Club are all here for your benefit. If you should have any questions regarding this vehicle or another in our inventory, please give us a call (403-930-7778) or pay us a visit at Mercedes-Benz Country Hills. Price includes $785 in dealer fees and levies. NO HIDDEN FEES. Plus GST. The Mercedes-AMG GLE SUVs are more than capable, confident and comfortable SUVs. They're capable of igniting your driving passion. Confident in their dominating power. And totally comfortable going places few SUVs would dare. Like your favorite back road, curves and all. A Mercedes-AMG engine only starts with the state of the art. From there, everything from fuel pressure to exhaust routing is developed to quicken, heighten and intensify its response, and yours. Developed for AMG's racecars, patented NANOSLIDE cylinder walls cut friction, raising endurance and power.Countless fortifications boost the AMG-enhanced biturbo V6 of the GLE 43 to 385 hp. A paddle-shifted 9G-TRONIC 9-speed turns 384 lb-ft of torque into a growling, grin-inducing rush. Based on AIRMATIC, the AMG Sport Suspension turns pressurized air into poised performance. It's also height-adjustable and adaptive. The many modes of AMG DYNAMIC SELECT let you dial in the shifting, throttle response, exhaust sound, and suspension settings with the twist of a console control. The precision, craftsmanship and advanced performance technology is not only under the hood of a Mercedes-AMG GLE SUV. You can feel it from behind the wheel, too, from its exclusive controls to its exquisite cabin appointments. Reach out to one of our professional Brand Specialists today to arrange a viewing and test drive. The state of the art facility at Mercedes-Benz Country Hills provides customers with an experience unlike any other. 3 lane service drive thru, 30 service lifts, Mercedes-Benz parts specialists and boutique, AMG Performance Center, the Benz Bistro, and Country Hills Kids Club are all here for your benefit. If you should have any questions regarding this vehicle or another in our inventory, please give us a call (403-930-7778) or pay us a visit at Mercedes-Benz Country Hills. Price includes $785 in dealer fees and levies. NO HIDDEN FEES. Plus GST. Born to perform, developed to outperform. Born to perform, developed to outperform. In an old mill in 1967, two automotive engineers with a passion for motorsports began turning Mercedes-Benz sedans into winning racecars. Today, as the performance division of Mercedes-Benz, AMG continues to create victory on the track and desire on the streets of the world. Every Mercedes-AMG vehicle is the product of craftsmen, designers and engineers who live to test limits, and for a singular goal: Driving Performance. The precision, craftsmanship and advanced performance technology is not only under the hood of an AMG GLS SUV. You can feel it from behind the wheel, too, from its exclusive controls to its exquisite cabin appointments. From the AMG-enhanced front air dam and 21-inch AMG wheels to their symphonic tailpipes, the AMG GLS SUVs capture admiring eyes. Biturbo engines, performance all-wheel drive and air suspension reveal thousands of details in impeccable harmony. Based on AIRMATIC®, the AMG Sport Suspension turns pressurized air into poised performance. It's also height-adjustable and adaptive. The many modes of AMG DYNAMIC SELECT let you dial in the shifting, throttle response, exhaust sound, and suspension settings. Reach out to one of our professional Brand Specialists today to arrange a viewing and test drive. The state of the art facility at Mercedes-Benz Country Hills provides customers with an experience unlike any other. 3 lane service drive thru, 30 service lifts, Mercedes-Benz parts specialists and boutique, AMG Performance Center, the Benz Bistro, and Country Hills Kids Club are all here for your benefit. If you should have any questions regarding this vehicle or another in our inventory, please give us a call (403-930-7778) or pay us a visit at Mercedes-Benz Country Hills. Price includes $785 in dealer fees and levies. NO HIDDEN FEES. Plus GST.